Click here for example pages from the Tutorial. 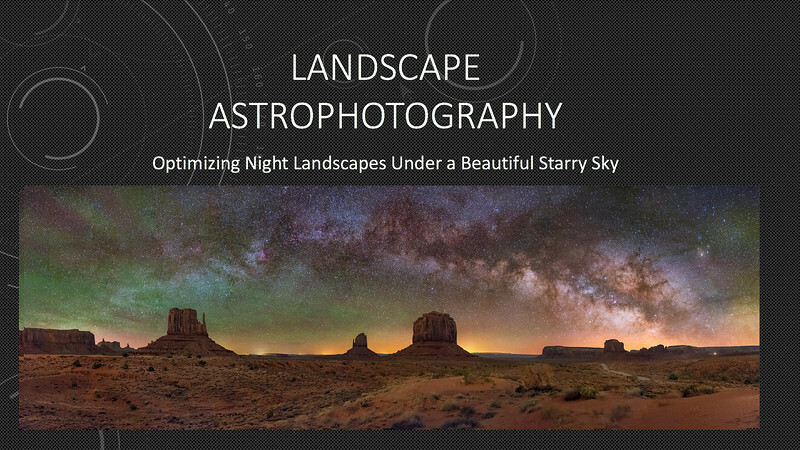 Complete Landscape Astrophotography Tutorial from image acquisition through processing. This is an extensive tutorial in a slide show format. 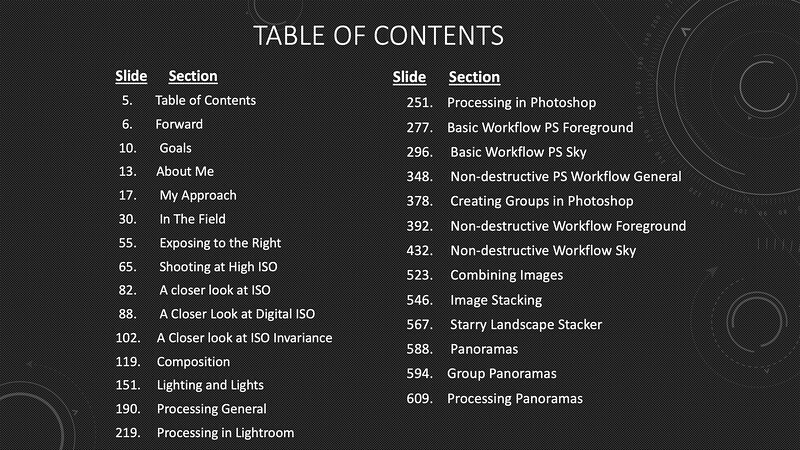 There are 600+ slides that include detailed step-by-step processing instructions using Lightroom and Photoshop as I do processing. Each step is explained and illustrated to make them easy to follow. The file can be downloaded by DropBox. The cost is $79 USD. Payment may be made by PayPal or personal check. 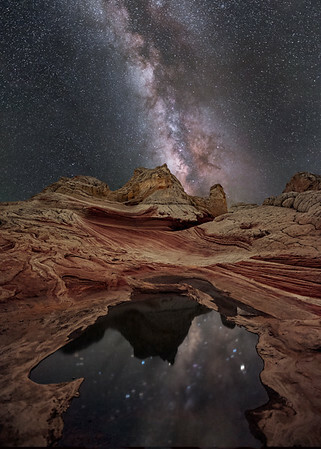 Click on the the "Contact Me" tab at the top of this page or email me at landscapeastrophotography@gmail.com . After you email me I will send you the email address to use making the PayPal payment and I will email you a link to DropBox where you can download the tutorial. A number of people have asked me if I had ever considered making post processing videos and selling them online. I have not made a video, but I have spent the last year creating an extensive teaching tutorial in a slide show pdf format (Adobe Personal Document format). Why choose this format instead of a video or book? Well, two main reasons: First, I myself get frustrated trying to follow a cursor around on a You Tube teaching video. I have to play the video over and over. This tutorial has each step illustrated so you can follow step by step and go at your own pace. An image is taken through the entire process in a simple editing approach, and then repeated in a non-destructive editing approach. Second, this format makes it easy to include innumerable images and screenshots. A printed book with this many images would be expensive. I may have this converted to an ebook in the future, but the images are larger and easier to view this way. I cover the logic of what I am doing as well as the steps themselves. The tutorial covers image acquisition in the field through processing, and also includes Low Level Lighting, Image Stacking, and Panoramas. Also included is the RAW image file used in the tutorial. You can use this to follow along on your computer. Also included are eight additional RAW Milky Way files you can use for practice. There is also a black type on white background version for printing. Several people have asked me for a printable version to hold in their lap while working on their computer. Also there will be a Planning Module in the future that will be free to purchasers. Future updates are are included. For Skype Tutorials (personalized individual live teaching sessions over the internet) please contact me using the Contact Me tab at the top of the page (on the Menu Bar) and we can schedule a session. Cost will be $100 for the first 2 hours and then $50 an hour for each additional hour. Payment can be made through PayPal. We can discuss any topics you desire from Low Level Lighting to Processing to Equipment. Processing sessions will be live using Lightroom and Photoshop. We will share computer screens and mouse control and we will process images jointly using either your images or a sample image provided by me. Emphasis will be on ease, flexibility, minimizing noise, and how to obtain a great night foreground to go with your beautiful night sky. Looking forward to hearing from you!